What's this? A new Wolfenstein game? Yeah, apparently I didn't get the memo. Activision brought the game, simply titled Wolfenstein, along to their press event in NYC last night and showed off the latest build. I was a bit disappointed to find out this was not a hands-on preview. An Activision rep played through the first couple levels of the game for a group of us, showing off some of the new abilities and weapons. The story is a bit convoluted. It takes place in a fictional German city called Isenstadt. Even the rep on hand had some trouble explaining it to me, but it involves ancient amulets and crystals. But I know you don't care about that stuff. You just want to shoot Nazis, right? One of the biggest included abilities is the "Veil" feature, which enables you to enter into this "otherworld." When using it, the entire environment turns a darkish blue and grants you new, special powers. The ability opens up new hidden passageways, bullet time, and even highlights weak points found on the stronger enemies. It's not unlike the feral ability found in Far Cry Instincts. Basically, it makes the game way easier than it should. Also, NPC's play a big part of this version. They're there mainly to add more storytelling elements, like something found in Half-Life. The demo was mainly focused on combat, so I was unable to find out how similar this was. Graphically the game looks pretty good. Although, after seeing the war zone atmosphere found in Killzone 2, this doesn't come close. There was a surprising amount of destructible environments; mostly the cover (such as tables and wooden structures) so it seems you may have difficulty hiding. I didn't see too many new weapons, but I did see one called the Particle Cannon, which zaps enemies to ashes immediately. You can bring down groups of Nazis in the blink of an eye. 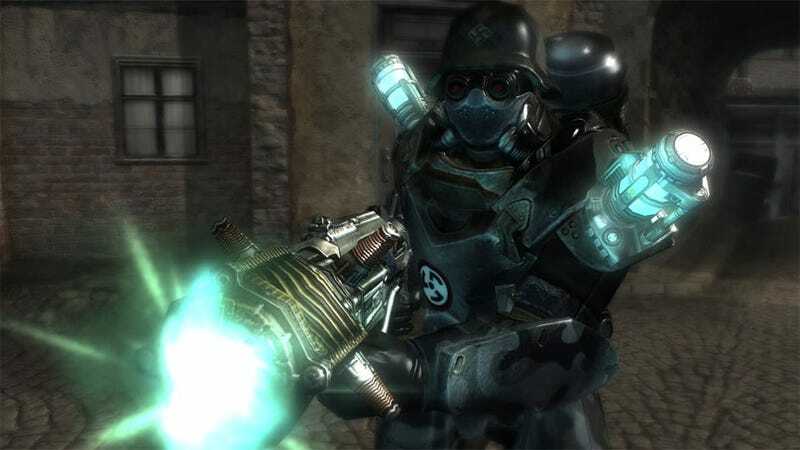 We were shown one mid-boss sequence where this super Nazi soldier wearing steel armor that shoots laser beams chases you. Using the "veil" power revealed his two weak points and he was brought down rather easily. I honestly had no idea this game was being made two days ago. I must have missed the E3 announcement last year. The game has no official release yet, but I would look out for it this year for Xbox 360, PS3, and PC.